High-end style with the right specs. The Corsair Vengeance 5180 is undeniably easy on the eyes and filled with great components, but it's not made for CPU overclocking enthusiasts. Building gaming PCs is something I enjoy. Being able to decide what components go into my case and what lighting scheme I want to add for fun means controlling the whole process from start to finish. But cable management is not something I’ve mastered yet, and some cases are built better than others for that purpose. Enter the Corsair Vengeance 5180. Not only does it come stocked with a GeForce RTX 2080, an 8th gen Intel Core i7-8700 (non-K), and just the right amount of other components to handle pretty much any game at almost any resolution, but its sophisticated style makes it a seamless edition for the home or office—and it’s one of the first pre-built PCs I’ve considered buying in a long time. Unlike many chassis that opt for plexiglass or another type of clear paneling, the Vengeance 5180 has tempered glass along the side, front, and top. The glass is propped up a half inch by special screws to allow for airflow. While there were no issues with overheating, the airflow doesn’t seem to be as efficient as other case designs, as the PSU fan will hum softly after the system had been powered on for a while. In addition, the RGB lighting looks extra illuminated behind the glass, which gives the lighting a subtle pop. You can also sync your favorite lighting display across all Corsair compatible peripherals and components with iCue. The most unique feature besides the glass is the case's dual component chambers. Through the side with the glass panel, only the motherboard, all-in-one liquid cooling unit, RAM, and GPU are visible. Everything else is tucked away neatly in the second chamber, which hides nearly every cable as everything gets pulled through the back—no messy cables detracting from the shiny hardware. The case itself weighs about 40 lbs., which isn’t terrible, and the shape of the case is basically a cube. Carrying it or maneuvering it around might be cumbersome, but it can still fit nicely on top of your desk without taking up too much space. It’s one of the prettiest cases I have ever seen, and would not mind sacrificing a bit of desk space just so I could show it off. One downside is the somewhat sparse number of USB ports and lack of an onboard wireless adapter. On the front of the case, there are two USB 3.1 ports, with four USB 2.0 ports on the back. I own enough peripherals to take up every single USB port—keyboard, mouse, webcam, microphone, printer, and photo negative scanner. The included Netgear Wi-Fi Adapter plugs into a USB slot rather than the motherboard, so that means I’d need to switch out my printer and scanner for whichever one I’d need at the time. If you own a lot of peripherals like I do, you might run into the same minor problem. Whether you are interested in this system as a whole or are curious as to how the RTX 2080 preforms with the Intel i7-8700, then you'll be happy to know the Vengeance 5180 handles remarkably, even when pushed to its limits. Running on Ultra settings at 1080p, in-game benchmarks top off at around 115 fps for Shadow of the Tomb Raider, 81 fps for Total War: Warhammer II, and 75 fps for Tom Clancy's Ghost Recon: Wildlands. As expected, Wildlands pushed the GPU hard at about 97 percent capacity during the most graphically intense scenes. As with my Asus GL12CX review, I unfortunately couldn't appropriately test at 1440p or 4K since I don’t have the right monitor, but I did test the GPU with 3D Mark's Fire Strike Extreme and Ultra benchmarks. In those tests, the RTX 2080 scored a 12515 for Extreme (1440p) and 6522 Ultra (4K), respectively, which is about what you should expect from Nvidia's new GPU. It’s also worth noting that DirectX 12 ran without a hitch on the Vengeance 5180, which is great considering DirectX can be finicky at times and I’ve run into problems in the past with other builds. Even with the new Intel 9th gen cores making a stir, there’s still nothing wrong with adding a 8th gen i7-8700 to a build. Cinebench benchmarks clock in around 186 cb for a single core and 1365 cb for multiple cores. That’s just under what Cinebench reports on its list, but I ran into zero performance issues while gaming, especially on Ghost Recon: Wildlands, which barely made a dent in overall CPU performance at 37 percent capacity, with 64 percent being the highest. But, if you want better performance you are out of luck. The i7-8700 is locked, since it's the non-K version, and the motherboard has a B360 chipset, which means it doesn't support CPU overclocking. If cranking up the dials to squeeze out a bit of extra performance is your thing, this comes as disappointing news, I'm sure. Is the Vengeance 5180 still worth it? The MSRP for this stylish and powerful system is $2,399.99, which is a reasonable price considering the cost of components separately. You’ll pay around the same amount to build it yourself compared to buying this pre-built PC, so it all depends on your budget, time, and if you care about overclocking. You may not be able to overclock the CPU, but for 1080p gaming on Ultra you won’t need it. It also comes standard with a two-year warranty that covers repairs on anything that doesn't involve swapping out components parts with your own. If you’re not an overclocking enthusiast, the Vengeance 5180 is worth writing Santa about this holiday season. Combined with the powers of the RTX 2080, the Vengeance 5180 gets plenty of good mileage from its i7-8700. It also comes bundled with a Corsair K55 RGB gaming keyboard and a Corsair Harpoon RGB gaming mouse, but the K55’s key switches are rubber dome. That's not a huge deal though, as I expect most gamers already have a trusted favorite mouse and keyboard combo. 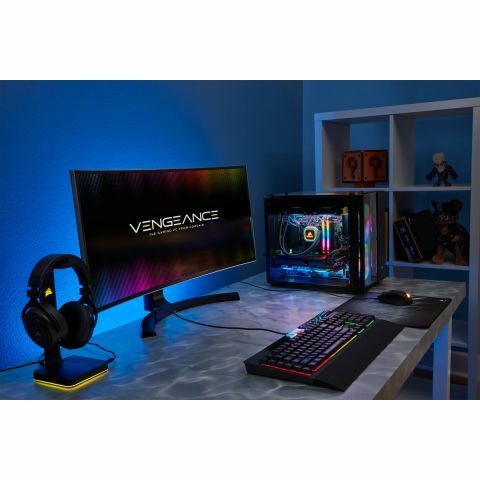 However, if you're interested in iCue compatibility to sync up your peripherals' light show with the Vengeance 5180, a model with cherry reds, like the K70, is a better option. But keyboards aside, the Vengeance 5180 is one of the more gorgeous pieces of tech you can add to your home.